European armies were traditionally fueled by conscripts—men who were pulled unwillingly away from their homes and families to serve at their king or dictator’s pleasure until the war ended, or they died, as likely from disease as from a wound. America has always been different. Until 1863, our soldiers had always been volunteers. Even after the introduction of the draft, volunteers were always considered a better sort of soldier, superior to the conscript, as well as to the professional soldier. Part of that dates to Washington’s belief in the Citizen Soldier who, when the war ended, would return to his proverbial plow. Throughout the early part of the 20th century, American Volunteers fought in wars around the world. American volunteers flew in the Lafayette Escadrille as part of the French air forces. Americans in the American Field Service drove ambulances and tended the wounded. Following the War, Americans joined Polish forces as they fought to keep the Russians from taking their freedom, and formed the Kosciusko Squadron, repaying the debt to the Polish nobleman, Taduescz Kosciusko, who fought in our Revolution. Many people recognized the threat of Hitler and fascism before war finally erupted. Winston Churchill secretly worked with “Wild Bill” Donovan, WWI Medal of Honor winner and future founder of the OSS, to prepare the Democracies for the war they saw coming. Many Americans, as well as brave people from other countries, donned the uniforms of other countries that were already fighting, unwilling to wait until America took up arms as a nation. The American Volunteer Group, better known as the “Flying Tigers,” flew against the Japanese in China. Others joined the “Abraham Lincoln Brigade” in Spain to confront the “Condor Legion,” Germans who were sent to test newly developed German weapons, and support the fascists of Franco’s Spain. When finally the War broke out on a larger scale, America held back for two more years until Pearl Harbor brought the War to our doorstep. Many Americans chose not to wait, though, and volunteered particularly for British and Canadian forces. Perhaps the most famous of these brave volunteers were the men of the Eagle Squadrons. Their service in the Battle of Britain and beyond was outstanding. Many of them had extremely successful careers as fighter pilots, and one, Captain Donald Gentile, went on to become one of the top-scoring Aces in the US Army Air Corps, with a total of 22 confirmed victories over German aircraft. Following America’s entrance into the War, most Eagle Squadron pilots transferred to US service. 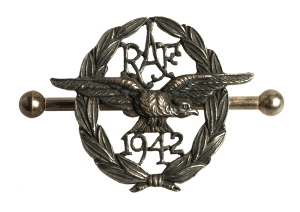 In July 1942, the British Royal Air Force chose to honor their service with a special award: a small sterling silver badge similar to the Royal Air Force cap badge, but with a spread-winged eagle, and the date 1942. These badges were allowed to be worn in US uniform, and a search for Captain Gentile will probably result in photos of him wearing his on the right breast of his US Army Air Corps uniform. The 1942 badges are extremely rare, and have been extensively copied. However, in our January sale, we have a superb original example of one. 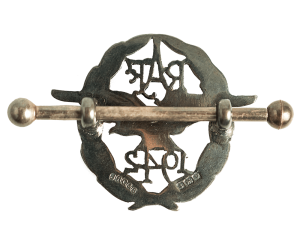 It has the correct British style fasteners, and is fully hallmarked for the year 1942. Interestingly, the gentleman whose collection it was in assembled a complete US Army Air Corps uniform on which to pin the badge. It is assembled out of all original pieces, gathered from a number of sources. It is a complete set of “pinks and greens,” the preferred Army Officer’s uniform for non-combat occasions. 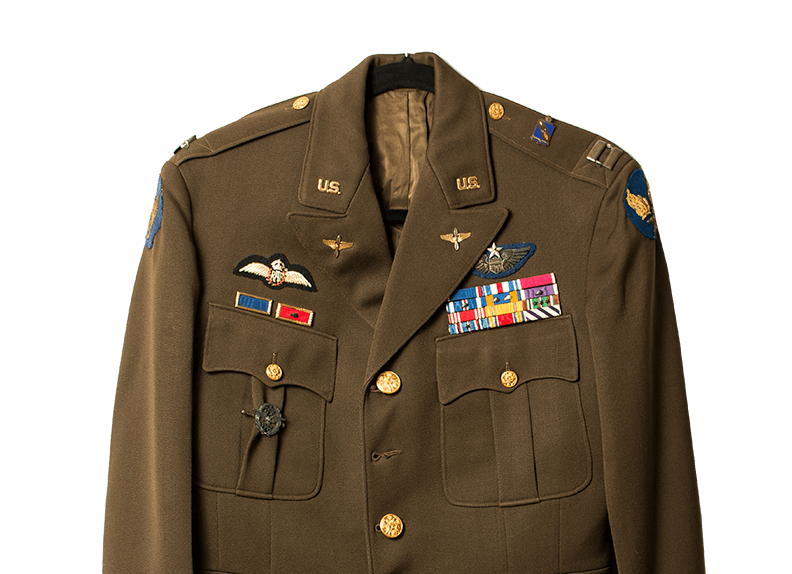 The uniform has actually been made to resemble Don Gentile’s uniform, including the ribbons for his British awards, and his RAF wings. Many countries had men serving in the RAF, as the island of Britain became the staging place for the resistance to Hitler’s Germany. There were Poles, Czechs, French, Norwegians, Danes, and others, so why were Americans alone awarded this beautiful badge? The answer is quite simple: until 1942 we were neutral, while all the others were combatants. The men of the Eagle Squadrons were actually risking their citizenship to put on RAF blue, as there was a law forbidding Americans from serving in another country’s armed forces. The penalty was loss of citizenship. Americans in the Eagle Squadrons not only risked their lives, they risked their homes to fight for freedom in the darkest hours of World War II.